I don’t know which came first, falling in love with New Orleans or the Sazerac. Actually… I think it was at the same time. A Sazerac, to me, is a simple drink that is so easy to mess up but when it’s right… Mmmmmm Mmmmm! When I thought about a chocolate one, well… why? Why mess with a perfect drink? Well, it’s because we can and it worked out nicely. Don’t worry, it’s still bone forward, not a sweet martini. 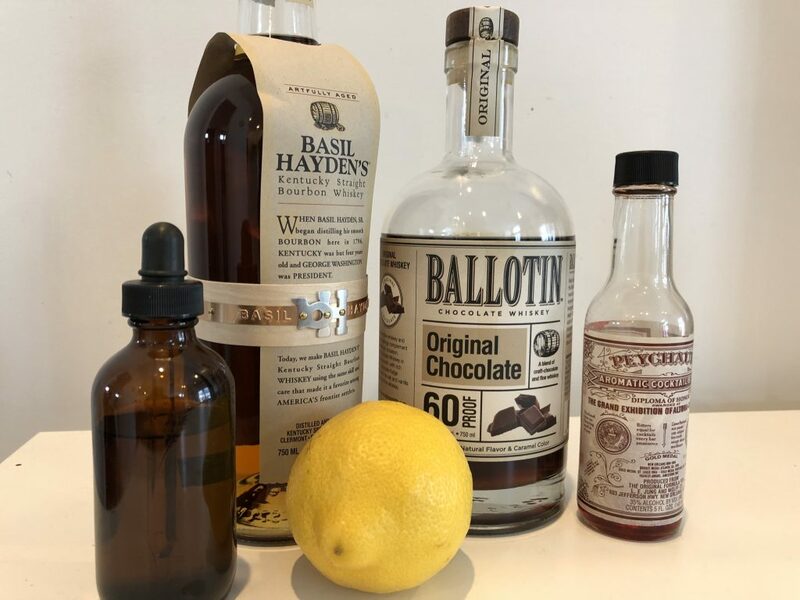 One large deviation I made from a traditional Sazerac recipe is that I didn’t use the sugar cube, instead, the sweetness comes from switching out Rye Whiskey with Bourbon and Ballotin Chocolate Whiskey. I found that using the sugar cube made it too sweet. Chill an Old-Fashioned or Coupe Cocktail Glass (Your choice depending on how fancy you want to feel) that has been rinsed with Absinthe or Herbsaint. You can also use a dropper at the end of the recipe if you like. In another glass full of ice, pour 2.5 ounces of bourbon and 1 ounce of Ballotin Chocolate Whiskey. Add 3 dashes Peychaud’s bitters but don’t let it get too pink, that will just ruin it! Stir all until nicely chilled. Take your time chilling…. it will be worth it. Now take the chilled glass out and strain the boozy concoction into the chilled glass. Lastly, take a lemon peel around the top of the glass and then garnish. Sip away and enjoy. Recipe Instructions: Chill an Old-Fashioned or Coupe Cocktail Glass (Your choice depending on how fancy you want to feel) that has been rinsed with Absinthe or Herbsaint. You can also use a dropper at the end of the recipe if you like. In another glass full of ice, pour 2.5 ounces of bourbon and 1 ounce of Ballotin Chocolate Whiskey. Add 3 dashes Peychaud's bitters but don't let it get too pink, that will just ruin it! Stir all until nicely chilled. Take your time chilling.... it will be worth it. Now take the chilled glass out and strain the boozy concoction into the chilled glass. Lastly, take a lemon peel around the top of the glass and then garnish. Sip away and enjoy.